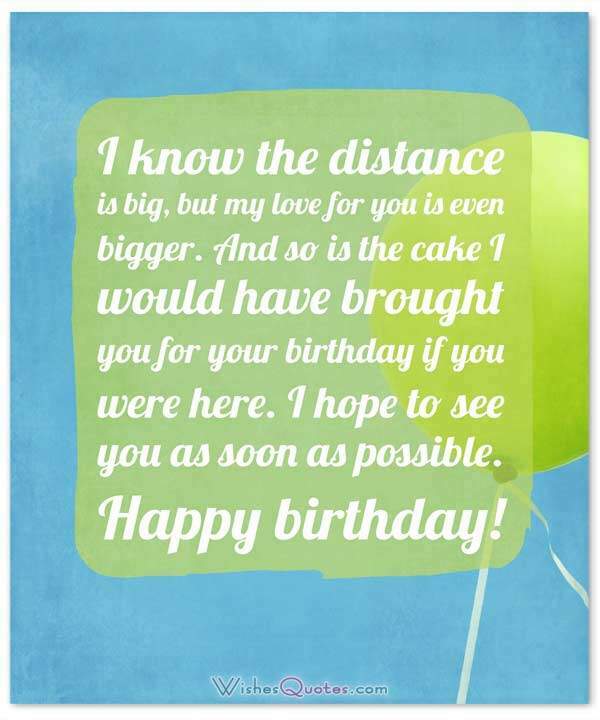 Browse the best collection of happy birthday messages from far away. 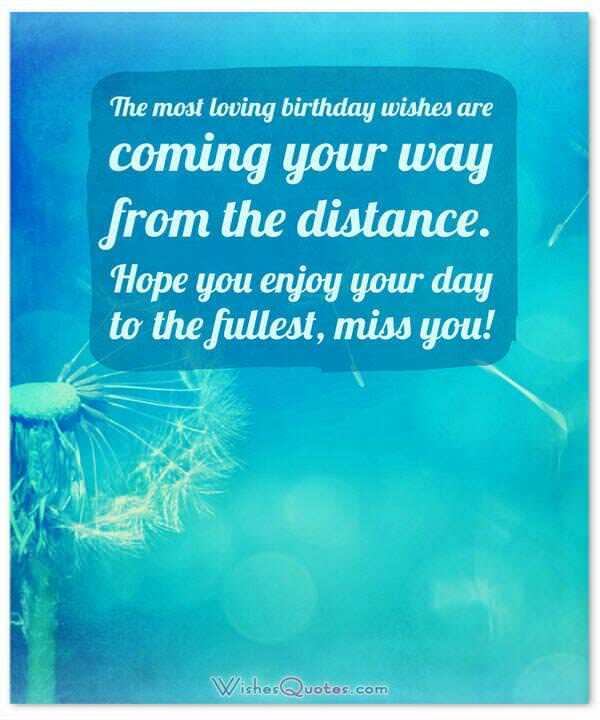 Send heartfelt birthday wishes to your far away friends and long-distance loved ones. Distance definitely is a deal-breaker for relationships of any kind. Even the toughest bonds can break, when they are at a distance for a pretty long time. Some may say, that true love never breaks, and I will agree, but I have to add that you have to do your part to keep the spark alive. And I can’t think of a best day to keep that spark alive, than on the birthday of that person that you have not seen for ages. But for you to be here, getting past “Happy birthday” is hard enough, let alone do a specialized wish for that matter. But have no worries, my dear friend, because this is why we are here for! We have provided you with the best birthday wishes for someone far away you can find on the internet! Even though you can use these as they are, it is recommended to just use them for inspiration, and write something that comes from your own heart, for it to be more special. Anyway, enjoy! I know the distance is big, but my love for you is even bigger. And so is the cake I would have brought you for your birthday if you were here. I hope to see you as soon as possible. Happy birthday! You may be thousands of miles away, but I still feel you right next to me. I wish you truly were right next to me though. Because then we could have done the best birthday party ever! Happy Birthday! When we first met, I told you that for you, I would even go to the edge of the Earth. Yet, you are so far away and I cannot attend your birthday. This does not mean I do not care about you though. I miss you, happy birthday! You cannot imagine how painful it is not to have you by my side every single day. Yet, life has brought it in a way that we must live apart. But no matter how many miles separate me from you, I still love you endlessly. Happy Birthday! No matter how big the distance is, it still is farther away than I’d want you to be from me. Without you, the room feels empty. That is why, I am using this day to say how much I love you, and that I can’t wait for you to come back. Happy Birthday! With you far away, my life seems like it has paused. And you cannot imagine how much I want you to come back so I can hit that resume button. Happy Birthday! One of the things that this distance has shown me, is how much I love you. Because ever since you had to go away, it is you that I’ve been thinking about every day. Happy Birthday, I love you. Ever since you left, our house has felt cold and empty. If it had a voice, it would have been shouting for you to come back, but because it can’t, I’ll shout instead in its place. Please come back, I love you and happy birthday! Being away from you, has given me a way to manipulate time, because hours seem like days, and days like centuries. But somehow we made it to your special day. So, happy birthday! I don’t know how depression feels like, but being away from you for so long has given me a pretty good taste. I pray that you come back as soon as possible. Happy birthday! Ever since you left, I’ve been feeling that something is missing, and just a plane ticket is not enough to fill that gap. I truly hope I could close the gap in my heart as easy as the distance between us. Happy birthday! There are some things that I hate not having in my daily life, but the one that hurts me the most, is you. Without you my life feels empty. Happy Birthday! 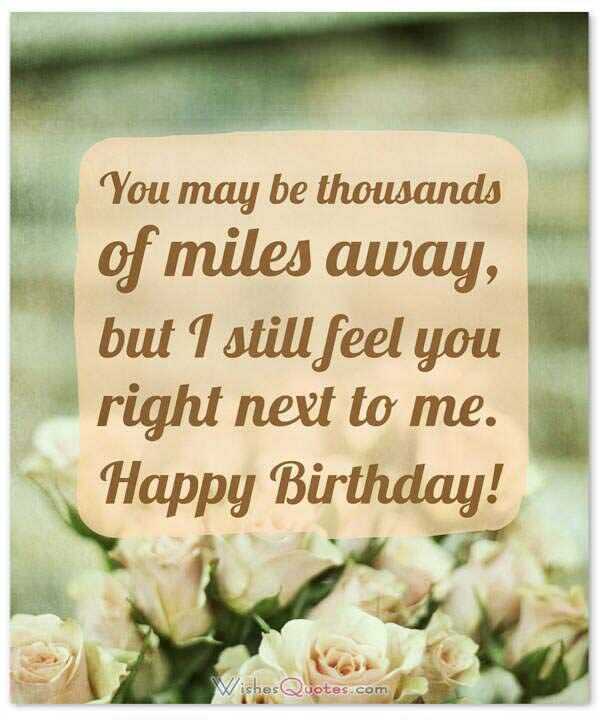 I’d like to wish a happy birthday to the only person that no matter how far away he/she is, it doesn’t feel like there is a single inch separating us. No matter how many pictures of your birthday party I see on social media, nothing beats the feeling of having you next to me on that special day of yours. I’d like to say that I miss you, and wish you a happy birthday! I know this is your birthday, but I’m feeling a tad of sadness next to my enormous happiness, because I have not been able to be with you. Yet, I want you to have the happiest of birthdays! I may not be able to give you a gift due to the distance, but I can give you all the love you deserve, because you are an amazing person. Happy Birthday! No number of miles is a distance that my love for you cannot cross. Yet, the circumstances have been such, that the trip is too much for me to do so that I can attend your birthday. 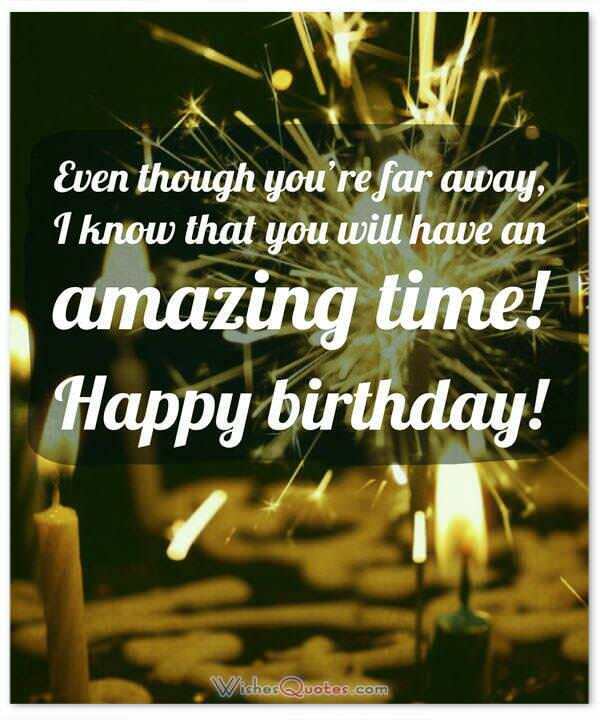 Thus, I am wishing you a happy birthday from miles away. Social media are trying to get me involved in the action that has been happening in this special day. But, no matter how many pictures and videos I see on my phone, it cannot replace the feeling I would get if I was there to celebrate with you. Happy Birthday! There is nothing worse than family being split aside. Yet, you have to spend your birthday away not only from me , but from the rest of the family as well. Yet, I’d like you to have the greatest birthday ever! No matter how much I want your birthday this year to be amazing, deep down, we both know that next year’s will be better, since you will have me to celebrate with you! Happy birthday! I truly hope, that you get a moment of happiness today, for every inch that is separating us, because you truly deserve all the happiness possible. Happy birthday! On this special day, all I can think of, is the times we spent together before you have to leave. I truly wait for you to come back, so we can continue living our lives together. Happy birthday! No matter how much distance and time is at our disadvantage, I want you to know that my love for you will never perish, and I will always wait for you to come back. Happy birthday! As the countdown of the moment of your return goes down, another countdown resets, and it is your birthday! You are now officially one year older, and I feel sad for not being able to celebrate there with you. Happy Birthday! It is unthinkable, that I am not able to be there with you on this special day of yours. Yet, some things don’t go as we want them to, and now you have to spend your birthday away from me. This does not mean that I do not want you to have an amazing birthday though. Happy birthday! I hope that my sincerest love and my best wishes, are enough to close this gap we have between us. I truly hope you have the best birthday of your life. Happy Birthday! Even if that day does not have me as a part of it due to the distance, I truly hope it is a day worth remembering for as long as you live. Happy Birthday! I know that you have settled down in this new life of yours, but we still miss you back home. I’d like you to have the greatest of birthdays, we love you! The bond we share, is not one weak enough to be hindered by insignificant things like distance. Yet, I’d like to have the chance to be there with you on this special day of yours. Now, best I can do is wishing you the happiest of birthdays! I cannot lie; I miss you, and think about you, each and every day that goes by. Yet, sharing negative feelings like sadness to you right now is not right. What I should be doing, is sharing with you the positive feelings, like my burning desire for you to have the happiest of birthdays!